Do you feel out of balance in your life? Are you living a Juicy Life? We all know the signs -- stress, ignoring priorities, always late, no time, kids growing up too fast, no creative outlets, all work, no play, loneliness. These signs are just that, signs pointing towards getting you to do something about it. Perhaps your organisation would benefit from a dose of work-balance, as a professional speaker I can help you deliver an inspiring message to your delegates. I often work with people to help them restore balance. This video beautifully shows what is possible in life when we restore balance. Work-life balance is an imperative tenet of living a great life. Your self knows when you are living out of balance -- and tells you so. If ignored or covered up, the feelings of imbalance will deepen and worsen, illness creeps in, stress manifests and your life will grind to a halt. You will then be forced to do something about it. Our forgiving mind-bodies can only live out of balance for so long. Act now! I invite you to seize the opportunity of recognizing the imbalance in your life and to use a life coach to help you unravel your current life situation to create a new way of living; Living out your life's purpose in harmony and balance. Think about this last week, how did you allocate quality time towards the following aspects of your daily life? Surprised? My life skills coaching goes way beyond time management and goal prioritisation, I take you on a journey deep inside your Self to reveal what is important to you in your life, why it is important, what your purpose is and how you can design a new balanced way forwards. We discover how to create a life of balance that devotes quality time to your Self, work, family, friends and your community -- a great balanced future awaits, by your own innate design. Work-life balance coaching will make great use of your intuitive awareness and life purpose as well as the opportunities that are presented by life change in general, or maybe a career change. 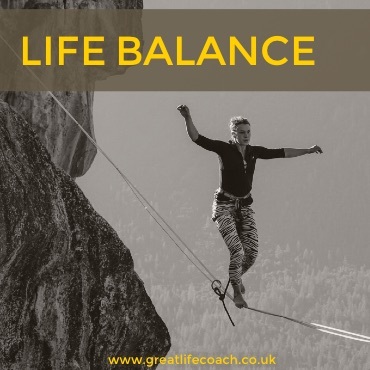 As a life balance coach I customise a program for you that takes your current imbalance and turns it into the basis for creating a great life for yourself. I coach and help already successful people navigate the challenges, changes and dreams that arise through adult life. I relish change as the most powerful tool we have to get what we want out of life. I will support you through the changes you want to make to achieve the balanced life you desire. If you are looking to change your life situation, if you describe yourself as lost, stuck or caught in a complexity you may find my Happiness Compass E-Course of great value. Take up the challenge of designing a balanced future. Using a safe and supportive foundation of trust, freedom of expression and commitment, I always work to help you explore your inner being, to regain balance in your personal and working life and to align with your true values and fullest potential. Using a stimulating face-to-face, phone support and email program customised to fit your current personal development needs, my coaching focuses on your inner guidance, purpose, skills, beliefs, techniques and processes necessary to take you into a great future.